Myles is seven-years-old and he can read the ingredient list for The Bushman's Bar! There are no preservatives, artificial colourings, or artificial flavours in The Bushman's Bar. acacia gum, rice bran, flax seeds, vinegar, citric acid, and natural flavor. There are no nut ingredients in The Bushman's Bar. However the bar is currently not manufactured in a nut free facility. There may be traces of nuts in the bar and we have this warning on the label of the bar. Each 60 gram Bushman's Bar is packed full of nutrition and delicious flavours direct from the Boreal Forest of Northern Canada. 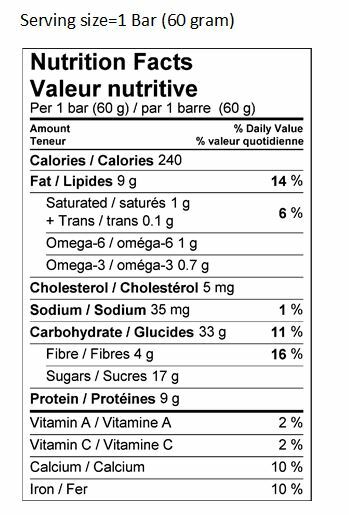 This bar contains many of the natural foods that are part of the diet of the animals who live in the Boreal Forest. Wild rice, honey, wild blueberries, cranberries, and sour cherry berries all grow in the Boreal Forest. They come together in The Bushman's Bar to create a soft, chewy explosion of flavour and nutrition. The Bushman's Bar is shelf-stable. It is packaged in a vapour-proof barrier material for added freshness. This is quite impressive because The Bushman's Bar is full of natural ingredients with no artificial colours, flavours, or preservatives. The Bushman picks wild blueberries in the Boreal Forest every August. The Bushman'sBar contains wild blueberries, sour cherry berries, and cranberries. These natural flavours make our nutrition bar "Wildly Nutritious and Berry Delicious" giving you a true taste of the Canadian North. So pack a Bushman's Bar for tomorrow's lunch-on-the-go, fishing trip, ten mile hike, marathon run, or energy-packed snack for that sporting event.